£500 free bet with Ladbrokes Exchange!! If you were not aware, the Ladbrokes Exchange is basically the Betdaq exchange under a new skin but this should increase liquidity on that exchange somewhat. The launch, originally scheduled for the first quarter of 2014, comes as part of a move to offer a wider range of products to its online customers. To start, Lads’ exchange product will be a desktop-only product, but mobile and tablet options are expected to follow within weeks. Just like Betfair and Betdaq, the Ladbrokes Exchange operates a layered commission structure whereby the more you bet, the lower your rate will be. Commission is charged on your net winnings from any single market. You do not pay any commission on losing bets. The standard commission rate is 5 per cent, but you will be able to bring that down to as low as 2 per cent depending on the volume of bets you have matched. Premium charge payers at Betfair will be pleased to hear that there is no premium charge at Ladbrokes Exchange. This of course doesn’t mean they can simply move all their funds and Betting activity to Betfair as liquidity is required and we’ve seen from Betdaq that it’s not an easy thing to attract. 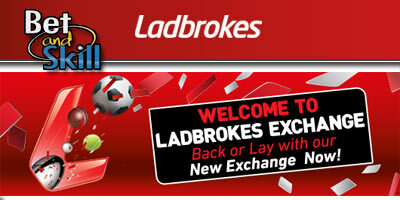 The minimum stake on the Ladbrokes exchange is £/$/€0.50 while the maximum stake is determined by your account balance. Ladbrokes customers will be able to take advantage of a "cash out" facility for the first time and their exchange users will be able to deposit or collect cash in more than 2,500 Ladbrokes shops in the UK and Ireland. Cash Out is an exchange feature that allows you to close out your position by either locking in a profit or limiting your losses. The Cash Out feature automatically calculates the bets you need to place to do either. Offers are requested in real time based on live market prices. Cash Out offers are not guaranteed and are subject to movements in market prices. It will be interesting to see how Betfair reacts to the debut of Ladbrokes Exchange, which marks the first serious challenge to Betfair’s exchange wagering dominance. Will the two firms engage in a commission price war? As always, all competition has to be good news for punters, and the new Ladbrokes exchange is certainly an exciting development in that regard. Open a new account with Ladbrokes! "Ladbrokes Exchange is now live with a new betting exchange platform"